Traditional Chinese medicine (TCM) can dramatically help people with Asthma. A TCM doctor approaches this illness in a very different method than a western doctor. Western doctors are first and foremost concerned with asthma symptoms. They prescribe medication that is intended to stop the onset of asthma attacks and they prescribe medications that are intended to get patients through the asthma attacks. Unfortunately, this approach doesn’t get to the root of why a person has asthma and what can be done to heal someone with asthma or at least dramatically reduce the occurrence and symptoms of asthma attacks. A TCM doctor such as Dr. Feng Liang will determine what is causing asthma in the patient and will then treat the underlying problems. A person may have asthma due to environmental allergens such as animal dander, dust, pollen, mold and other substances (some foods can even cause asthma attacks). In this instance, Dr. Liang will first recommend to a patient that they do what they can to remove the allergens and will then treat the patient’s system to better tolerate the allergens. Dr. Liang points out that asthma is an immune disorder. It is the body’s immune response to the allergens that are around us and in the environment. So the treatment for asthma focuses on balancing and strengthening the immune system. With acupuncture treatments combined with Chinese herbal medicine, patients will see a decrease in their asthma symptoms. This includes wheezing, coughing, pain and tightness in the chest, shortness of breath and difficulty in breathing. During the course of the treatment, a patient will be able to decrease the amount and types of medications that they take for their asthma. Their body’s constitution will become stronger and balanced. Patients will become less sensitive to or less irritated by the triggers that cause asthma attacks. The most promising benefit from acupuncture and Chinese herbs will be the long-term effects. A person may have either been born with asthma or developed it later in life and a combination of diet, stress, lack of exercise, and overweight condition may trigger asthma attacks. In this instance, Dr. Liang will recommend that the patient changes their diet and starts some type of exercise regimen to reduce their weight. For asthmatics, breathing exercises is extremely important. Dr. Liang would recommend and teach her patients how to do specific breathing exercises to strengthen their lungs and the airway. Most asthma medications recommended by doctors have side-effects and many patients are not even aware of how these medications are affecting their overall health. A case in point is one of Dr. Liang’s patients who has been taking Symbicort as an aid to stop the onset of asthma attacks. This medication has served the patient fairly well over the years, however, it has left the patient with some side-effects that are very undesirable. The patient has gained weight over the years and been unable to lose the weight regardless of a very active exercise program and dieting. Weight gain and inability to lose weight are side-effects of Symbicort. But the biggest side-effect is that this patient’s blood pressure has dramatically increased and the patient was placed on anti-hypertensive medication to counteract the high blood pressure. This has exposed the patient to a new set of side-effects. Dr. Liang is now working with the patient to get him off of the Symbicort and anti-hypertensive medication. 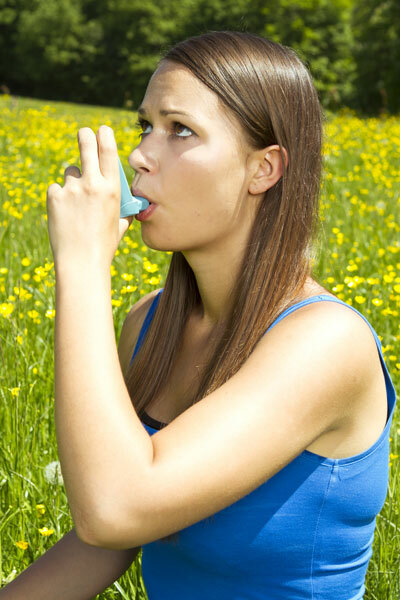 Most people with asthma are very familiar with two medications: Provental® (albuterol) and Prednisone. Albuterol is commonly referred to as a “rescue inhaler” and is the one item that many asthmatics feel that they cannot live without. However, this medication does come with side-effects that can have very serious consequences. If an asthmatic takes aspirin on a regular basis while taking albuterol, they will develop polyps in the nasal pages. This can interfere with nasal breathing. Prednisone has a long list of side-effects that are too many to list here. You can read about these at Webmd.com. This is another instance of a western medication that can be very beneficial in the treatment of asthma, but there are so many side-effects, and the side-effects are so severe, we would ask you to consider whether the treatment is worse than the illness. Dr. Feng Liang has been very successful in treating both children and adults who have asthma. She has used acupuncture coupled with Chinese herbs, diet modification, exercise, and stress reduction to help her patients. Some have been able to stop taking their asthma medications completely. Many doctors now acknowledge acupuncture and Chinese herbal medicine as a very safe and effective means to treat and heal patients who have asthma. Dr. Liang would like to mention that asthma is a life threatening disease. It is your responsibility to treat it correctly. Western medicine can rescue you from an asthma attack. Chinese medicine will help you heal from it. The treatment may require a period of time to achieve maximum results, however, this investment of your time will dramatically improve the quality of your life.